or more accurately stated, my blue jeans are just a muddled, fuddled, puddle. or say farewell and bury the remains. Never the less, there are only so many hours in a day, and one wants to move forward as opposed to just treading water, so these valuable experiences need to be limited and avoided. 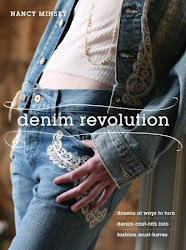 Soft, worn denim is very pliable. Handle it gently so it will not stretch out of shape when you mend. Baste patches before sewing. In this way you won't be fighting a bundle of straight pins and your stitches will be much, more lovely and professional. Most jean side seams are closed with one, easy to rip out row of stitching. Using your seam ripper, open it from a couple inches above the hem to a couple inches below the pocket. This will make it easy to maneuver around and stitch as you mend. When you have finished with all your repairs, re-stitch the side seam closed, along the original stitching line. Patch the enlarged, worn area, not just a specific hole, as otherwise you will soon be mending again. Make the inside as neat and tidy as the outside. This will make your repair more durable. For added durability, secure with lots of back stitches. Sandwich the thread end knots between the patch and the jean to avoid the knot rubbing open with wear. Denim has a character all its own and will easily adapt to all sewing abilities so let your mending flow along and enjoy the satisfying pleasure of accomplishment. Denim comes in many different shades. When choosing your thread, take your jeans along to the notions shop, as you will be surprised at how many color variations are possible. A shade matching the color of your jeans will be more subtle and blending, while a novelty color of thread, such as a bright red, metallic or ochre color, or embroidery floss, will be more decorative. All these choices are viable, interesting and effective – they are about expressing your individuality, creativity and style – so enjoy the process of choosing. Approach the thread and denim patch choices like a designer. Think about the characteristics that you love in the jeans and if you want to enhance those features, compliment or contrast them. You are going to re-make, re-invent your jeans with your own signature, one-of-a-kind detailing. It is a fun, creative, process. AND you deserve lots of kudos! If you are not satisfied with the end results, grab your ripper, and take out the stitches and do it again. A favorite pair of jeans is worth the extra effort of creating something you adore. Jeans in need of repair arrive in many different forms. Sometimes you have a favorite pair of jeans with a hip "worn-in" look, which is too fragile, breaking into annoying holes. 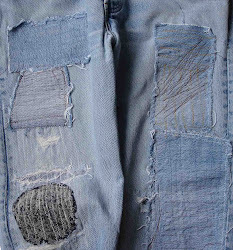 Or you want to juice up a pair of boring jeans with some creative patchwork. Maybe the knees need to be strengthened. Choose the repair method that will be enjoyed by the wearer for both the durability and the style. Patches can be cut in amusing shapes, such as flowers, butterflies or hearts. Make the inside as beautiful as the outside. The wearer will enjoy the beauty every time they slip them on. If it seems all too overwhelming, then pause, and make a pin cushion from denim scraps…. Denim can be tough like leather so use your thimble when hand stitching. Sometimes the edges of a rip can be brought together and repaired so that the rip is almost invisible. Other times there is a missing gap. Either way, always let the denim lay naturally smooth and flat when you sew. "Denim" or "leather" needles are handy for sewing heavier weight denim. A machine stitch length of 8 to 12 is appropriate for basic denim, and 10 to 12 stitches for lighter weight denim. You can straight stitch, zigzag stitch or hand stitch patches. It is all about style. Do you want it to contrast or blend? I've had to rip-out and re-sew patches when my plans just didn't make the cut. Check your idea on a small section to avoid my blunders. Iron-on patches are another option. Follow the directions on the package and from my experience, reinforce with a stitch around the perimeter if they will get a lot of wear. Press all your patches and jeans before sewing, so that you have a smooth and easy surface to sew. Sometimes, you must admit, that a pair of jeans are simply no longer worth repairing. In that case, toss them into your re-cycle bin to use for other projects or patches. 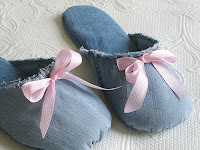 Old, worn denim has many surprising uses. Since denim varies in color, keep all your old jeans, so that you will have a selection of shades to sort through when you are patching. Denim patches are wonderful on all kinds of clothing, to hide moth holes in sweaters, patch sweatpants, t-shirts or jazz up something old. And when you finish, celebrate your accomplishment. 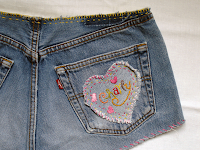 Put on your "new" denim clothing, kick up your heels and enjoy your truly lovely, handiwork!